Recognized as one of the most important instrumentalists and composers in rhythm & blues and soul music Ernie Isley remains one of the innovative voices in contemporary American music. Ernie was born in Cincinnati where his older brothers formed The Isley Brothers, first as a gospel group, then as a secular singing group. In 1960 his family moved to Englewood/T-Neck, New Jersey. Jimi Hendrix lived in the Isley home and played guitar for The Isley Brothers for two years, 1963-65. Ernie started playing drums at 12. His first live gig as a member of his brothers' band was as a drummer in 1966 at the age of 14. Ernie was influenced by Jose Feliciano's version of "Light My Fire" and in 1968 he got his first guitar. He is a self-taught musician. In 1968 he did his first professional recording, playing bass on the Isleys' breakthrough funk smash, "It's Your Thing", released in 1969. 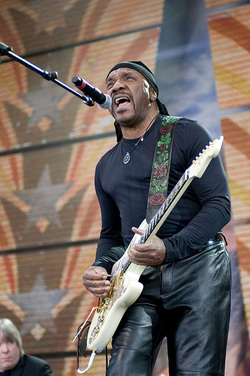 He played electric guitar, acoustic guitar, and drums on the group's early 1970's albums "Get Into Something", Givin' It Back, and "Brother, Brother, Brother", before fully joining The Isley Brothers in 1973, becoming a mulit-instrumentalist playing acoustic guitar, electric guitar, drums and percussion. Ernie is a prolific songwriter, penning such Isley classics as "Fight The Power", "Harvest For The World", "Voyage To Atlantis", "(At Your Best) You Are Love", "Footsteps In The Dark", "Brown Eyed Girl", among others, and "That Lady" (co-written with brother-in-law Chris), "Between the Sheets" (co-written with brother Marvin and Chris)", Take Me To The Next Phase (co-written with Marvin and Chris) among other songs. His signature guitar riffs are easily recognizable on classics such as "Summer Breeze", "That Lady", "Voyage To Atlantis", "Choosey Lover", and others. In 1984, Ernie, Marvin and Chris formed the group Isley-Jasper-Isley, scoring with their number one album "Caravan Of Love". In 1990, Ernie released his first solo album, "High Wire". In the same year he recorded a cover version of The Cars' "Let's Go" for the compilation album, "Rubáiyát". In 1991, he rejoined Ronald and Marvin on tour and in the studio. In 1996 they scored with their platinum CD "Mission To Please, and again in 2001 with "Eternal", the lyrics to the title cut written by Ernie. The Isley Brothers were inducted into the Rock n' Roll Hall of Fame in 1992. Currently Ernie and Ronald work and tour together as The Isley Brothers. In 2010 and 2011 he participated on the Experience Hendrix Tour. He is a musician on the Janet Jackson album, "Discipline", on the tracks "Never Letchu Go" and "The 1". He performed on the majority the 2012 Joss Stone CD "Soul Sessions II". Fender Custom Shop has built for him three custom Zeal Stratocasters, using his personal design. Ernie is active as a musical mentor in schools and community music programs. He has been a returning guest lecturer at Berklee School of Music in Boston. He is married to a writer/photographer and has one daughter. In 2014 Ernie Isley intends to tour a jazz fusion project tentatively titled "The Real Soul Jazz".